Accept Shalidor's gift of the Eidetic Memory. After all we've been through together, Arch-Mage Shalidor wants to offer me a kind of memory boon, a way to recall every book I've ever read. Speak to Arch-Mage Shalidor outside. At the conclusion of The Mad God's Bargain, exit the Eyevea guildhall and speak with Arch-Mage Shalidor outside. His attitude will depend on your decision to save Valaste or not, but regardless of the choice you made he will express his gratitude. 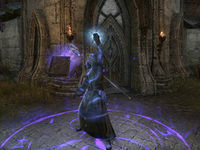 As a reward for returning Eyevea to Tamriel, he will gift you with the Eidetic Memory, a magical ability he developed to remember every scrap of paper he ever read. This will manifest itself as a new tab in the Library section of your Quests menu, which lists all miscellaneous books, notes and letters not included in the Shalidor's Library collection. Shalidor has asked for a moment to prepare the memory charm. Finishes quest I should speak to the Arch-Mage again so that he can cast the memory charm on me.